Happy Friday! Thank you for your support and reading my last post about HOW we ended up in Colorado. I barely read books anymore (but every now and then fit in an audiobook). Lately, I find myself reading articles which I usually find via Twitter or Facebook or TheSkimm. I bookmark them or use Facebook's handy save option, but I don't usually share them so I want to start some of my favorite reads monthly around here. I can't wait to make this bird feeder with Maggie. One of my favorite books, Surprised by Motherhood (I listened the audio version), is on sale for Kindle through the end of the month. Agreed: this life stage is hard, but I wouldn't change a thing. Snapchat isn't useless, in fact it encourages storytelling. Sometimes it can be a struggle to buy local, but this is a great reminder of its importance. I've been trying to incorporate more natural remedies from into our life and have been using hydrogen peroxide to get stains out (works great on baby poop). I'll admit it, there are some emojis I've been using incorrectly. There seem to be so many drawbacks to the age of technology we live in and this is what scares me the most: the end of empathy (adult language warning). Now that we live out west, I need to tackle some of the things on The Great American Bucket List in this part of the country. What ARE we doing here? If you follow me on Instagram, you may be wondering why we left our east coast city life or why I walked away (hopefully temporarily) from a great career in higher education after nearly 12 years. To be honest, I have to remind myself what we're doing here too. Not in a "get me out of here" kind of way, but more of a "how did this even happen?" I realized I hadn't really shared how we actually got here. I mean the HOW behind WHY we live in eastern Colorado. It's a great story (but I'm biased of course) and one I'm excited to share. 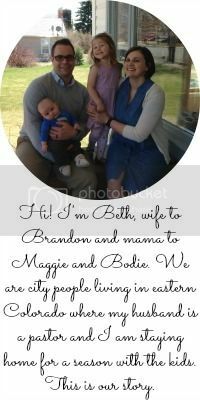 For the past few years, we had been planning to move to Colorado once my husband, Brandon, finished graduate school. We didn't have any family in New England and while I didn't grow up near grandparents because my dad was in the military, I yearned for my kids to experience living close to at least one grandparent. Brandon finished his coursework in seminary last August. He had to quit his job to attend the last two classes because they met during the day (all of his previous courses met evenings and weekends). It was our first step of faith in this process-- to go to a single income and trust that God would provide a job 2,000 miles away and he could begin his career as a pastor. We also had a bunch of unfinished home improvement projects on our 1922 colonial, so Brandon was able to work on those once his classes ended. 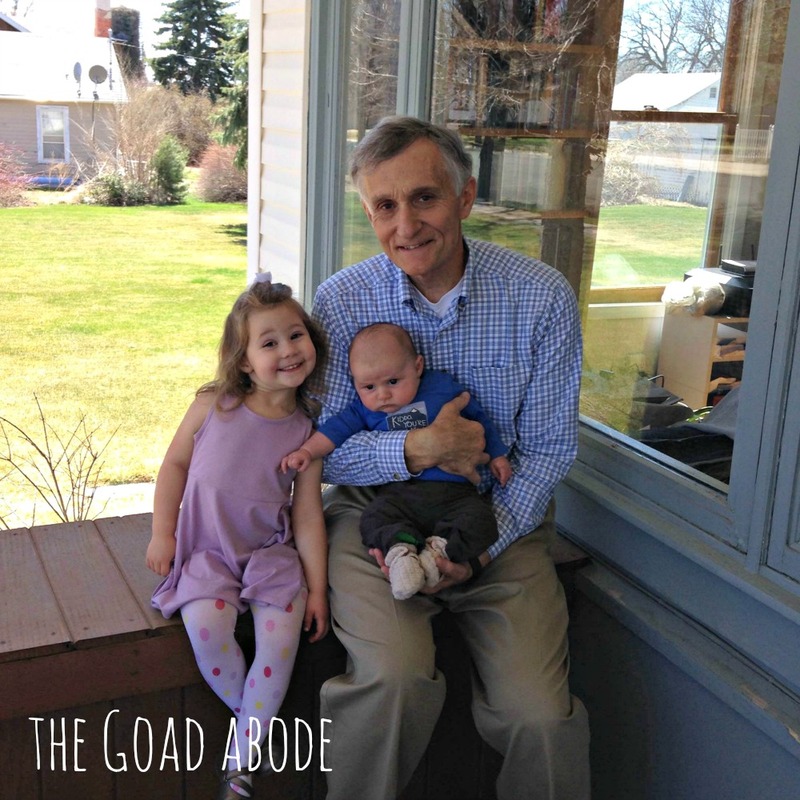 He began the job search for pastoral positions. In an effort to be closer to my family, the search was concentrated in Colorado. After some time of searching in one city and getting discouraged by the lack of openings, we discussed and prayed about widening our search. We decided to look at the whole state, and even northern New Mexico to increase the options. Every time Brandon came across a new opening, I would check out google maps because several of the towns/cities I had never heard of and I wanted to see how far the drive would be to my dad's house. 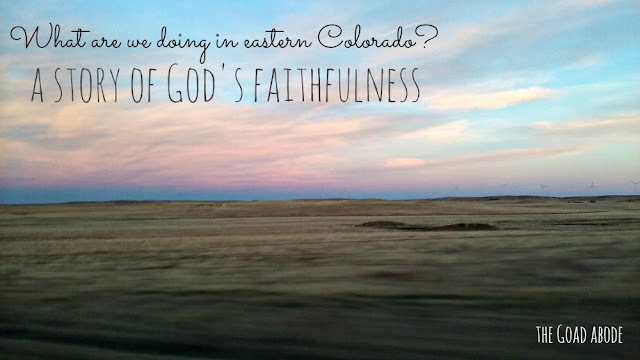 Within days of applying for a solo pastorate on the eastern plains of Colorado, he got a phone call from a church and they setup a phone interview in November. While visiting my family at Christmas, we had a chance to meet with the search committee and see the town. Within hours of the interview ending Brandon was asked to preach the following Sunday (four days later), so we extended our stay a few days and got to spend even more time there. 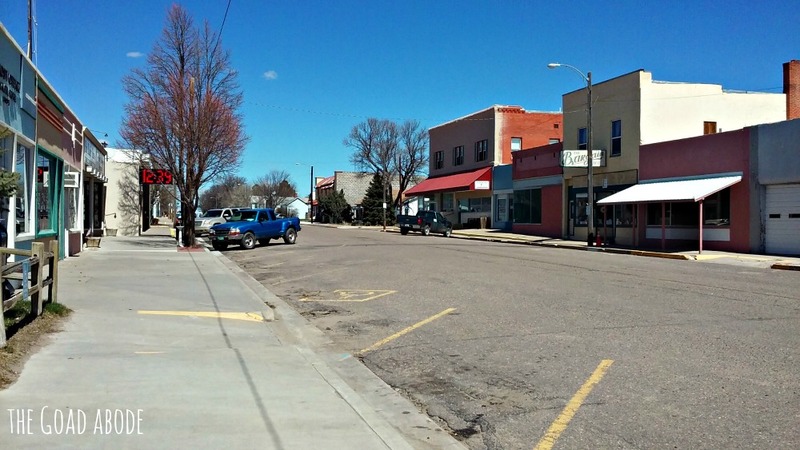 After meeting more people in this small, agricultural town, I was surprised at how easy it was to imagine our little family living there. I felt so genuinely cared for throughout the whole process (and I wasn't even the one they would hire!). About three months after that first phone call, he was officially called as pastor in February. We had about six weeks to have a baby, pack up and plan the move before he would begin on April 1st. Meanwhile, I was working full-time and growing a baby-- there was plenty to occupy my mind. The due date was getting closer and I was wondering how the whole moving across the country with a toddler and newborn would shake out. But God provided in yet another amazing way! One Saturday morning Brandon got a phone call from one of the men on the search committee telling him that he and his wife wanted to drive our moving truck across the country for us. What?! It was truly such a blessing. So I ended up flying with both kids, while Brandon drove across the country in our car and the couple drove our moving truck. We moved into the parsonage (with lots of help from our new church family) and had some time to unpack before Brandon officially started. It's been about a month since the move and there are a lot of people to get to know and places to explore. We are really excited about this opportunity and sometimes while I'm driving, I just look at the huge sky (if you've been to the western United States you know what I'm talking about) and think about how quickly life can change. In a matter of months, we went from Brandon finishing seminary to job searching to moving across the country for him to have this exciting opportunity! No, I didn't get a tattoo. But as I prepared for a new season (staying home), I wanted a visible reminder that it's not about me. 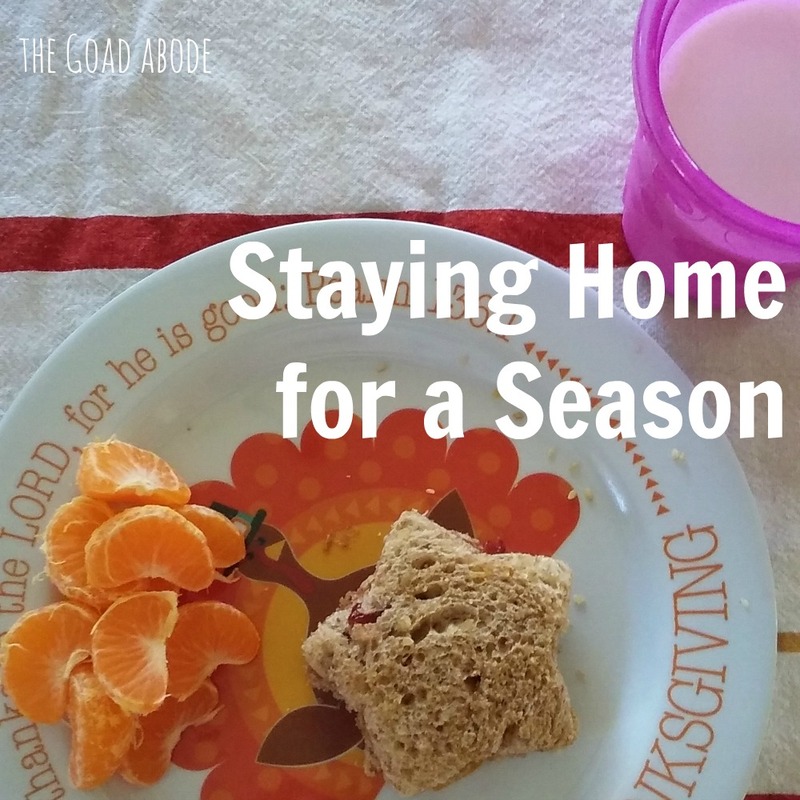 My staying home with two kids season has purpose. 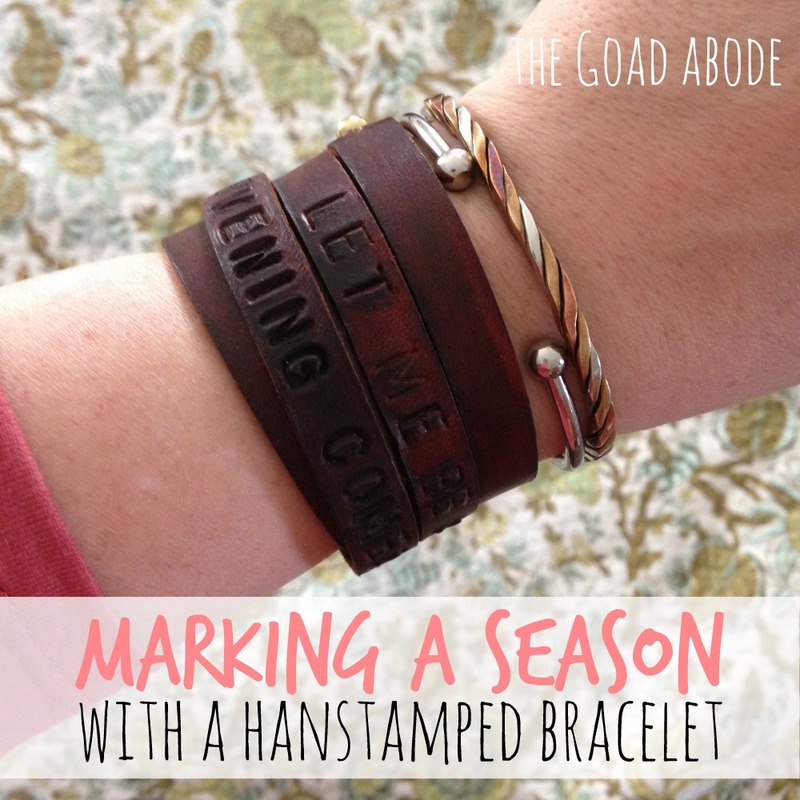 I can't really take all the credit because I was inspired to get a bracelet with meaningful song lyrics after reading this blog post from Rachel. I just loved this idea, but I struggled to find a song that fit this season. I've been experiencing so many emotions in this new season. I am excited to finally be able to stay home with my kids, something I longed for while working after Maggie was born nearly three years ago. But as I enter an unknown place, I have my own fears and anxieties. In addition to staying home, I'm now getting to be known as the pastor's wife since my husband has a new job. 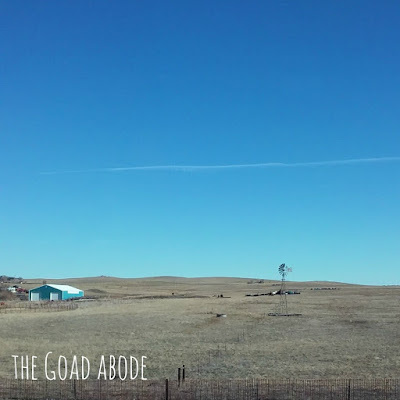 I can't remember if I landed on the song before or after Bodie arrived, but I do recall singing along to a song while showering one day and being struck by this line: "Let me be singing when the evening comes." I just stopped for a minute and thought about how true I want these words to be for my life. No matter how many things I'm juggling, I want to have the ability to sing praises to my Creator when each day ends. As a mom, there are moments the last thing I feel like doing is singing. I want to scream if I hear one more thing about an imaginary friend or have to unbuckle the toy carseat again. But those really are not terrible things at all. It is such a joy to have a child with a vivid imagination and a privilege to play with her. I don't have work emails hanging over my head anymore, but I can plan a day of fun activities for my daughter and son. Once I decided on the quote, it was kind of a challenge to find someone that would put all the words I wanted on a bracelet; most handmade shops only put initials or a name on their jewelry. Fitting a phrase on a bracelet required me to do some searching. I follow Melody Joy Designs on Instagram and have always loved her leather cuffs. I seriously love the way a leather cuff looks and can be layered with other bracelets (I already wear a silver cuff from my mom and a twisted cuff from my husband). 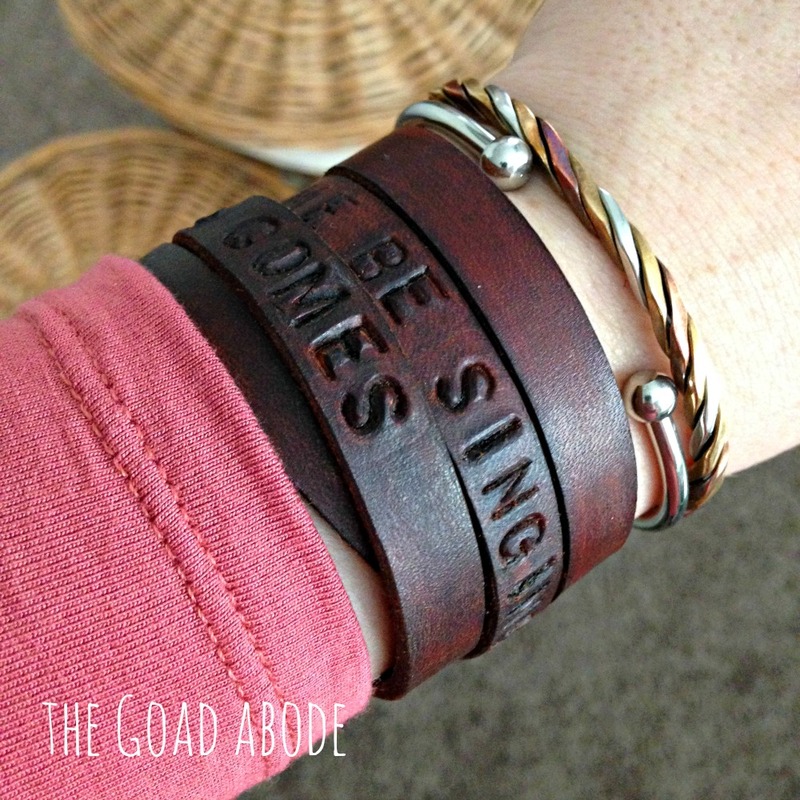 Melody Joy Designs cuffs come in various colors and I noticed she stamped some other bracelets so I just asked her if she would be willing to stamp a leather cuff for me. Since the cuff wraps around your wrist four times, I figured the phrase would have plenty of room to fit. And an added bonus --Melody didn't even charge extra for the stamping! I just love how it came out. It's a beautiful reminder to me of how I want to be joyful throughout the day. I know I will have my rough days and the last thing I'll feel like doing is singing, but these words on my arm will remind me of God's goodness. He's allowing me this season. I don't know exactly what He will do with it, but I am confident He will give me plenty to sing about. 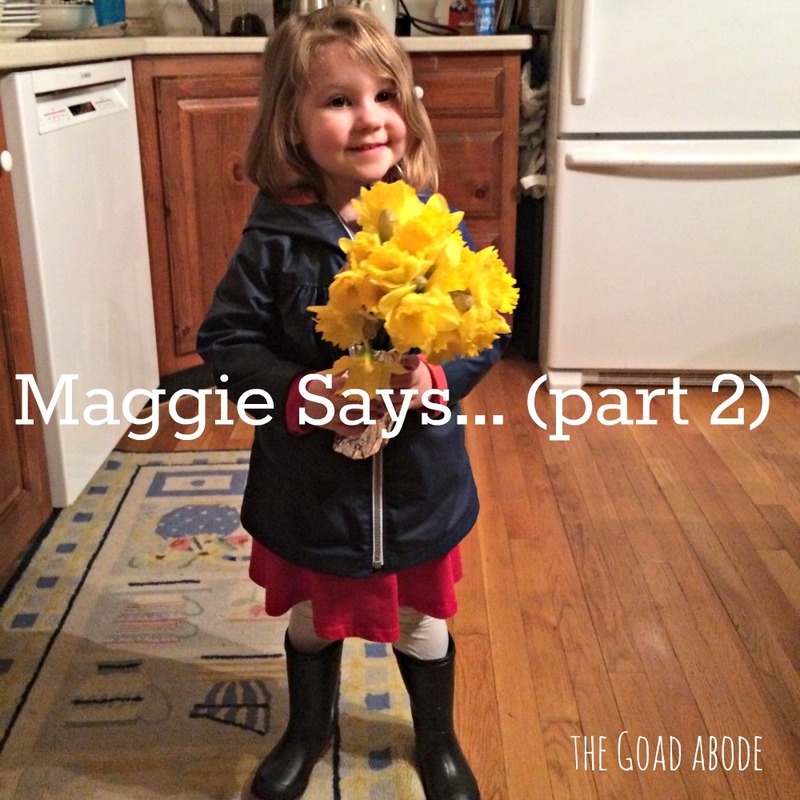 One afternoon, Maggie came downstairs with a pair of my shoes. She walked around the living room with my shoes on for a while. About an hour later I could only find one shoe and asked her where the other one was. Maggie's reply: "it's on the stairs like Cinderelly's." "I think he's saying hi" or "I think he's giggling." "I'm not a guy, I'm a person." The flight attendant greeted her with "Good morning, sunshine" and she quickly replied, "I'm not sunshine, I'm a kid." When asked if she had seen a receipt I was looking for she shrugged and said "maybe it flew away." While passing a pickup truck pulling a trailer on the highway, she said "Daddy, those trucks are stuck together. Isn't that silly?" Then started laughing. When I asked her why she was repeating me, Maggie said "I pete you, mama." My goals for the month of March were kind of funny. I mean who was I trying to kid? It was pretty much survival mode. I just had a baby and I was moving 2,000 miles across the country. My daily goal was to get as much done as I could. I went to bed most nights telling myself I would do whatever the undone thing was the next day. 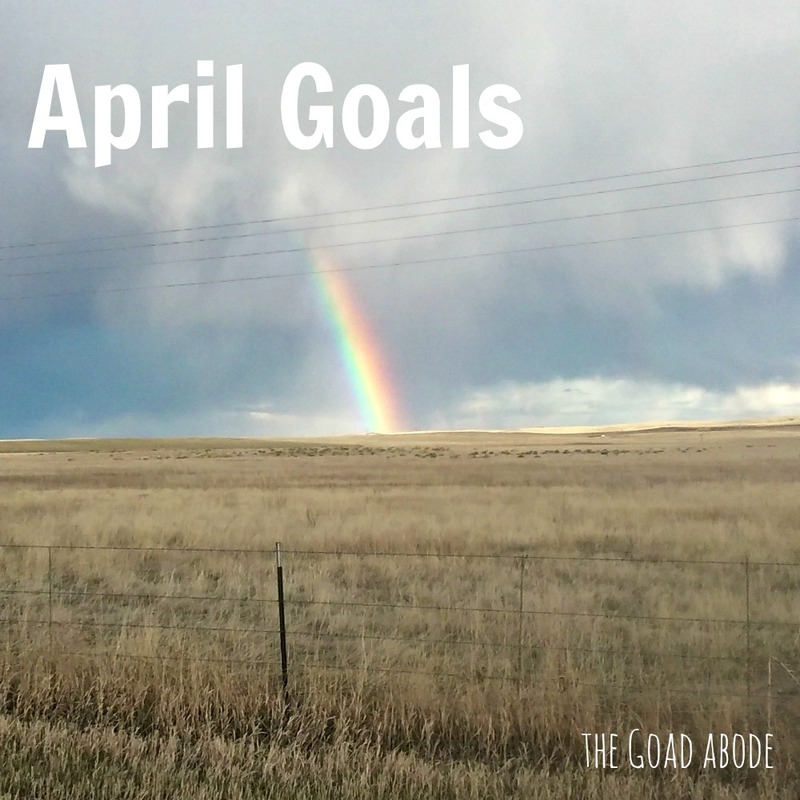 But for the sake of consistency, I will review the goals I set in March. 2- Send out Bodie's birth announcements. I was waiting to get out PO Box in Flagler. I will send them out in April. 3- Bake Irish soda bread. Yes, I did this one before I packed all my baking pans. 4- Not feel guilty for snuggling my newborn. I tried, I really did. Things were not as clean as I would have liked the house to be when I left, but we did it. 5- Keep up with thank you cards. I was able to keep up until those last few days and now I'm just way behind. I was blown away by the friends who stopped by in our last days in MA to say goodbye and humbled by the help we received upon arriving in CO. I'm just so grateful. My goals for this month are pretty basic, but I still wanted to set them for the sake of consistency and giving myself something to work toward. 1- Make healthy lunches. This is just as much for Maggie as it is for me. While I don't expect to get into a routine this month (but maybe? ), I do want us to try to eat healthy lunches which really just means, protein, fruit and veggie. If you have suggestions or go-to lunch ideas, please share! Tweet me or leave a comment below. 2- Introduce some pre-school activities into our weekdays. I've been inspired by some other mamas I follow on Instagram and mentioned this already. I bought a few supplies (pom poms, popsicle sticks, construction paper). I will need to spend some time planning activities for Maggie to do, but thankfully there are a ton of resources online. 3- Unpack my clothes and finish setting up our bedroom. We've unpacked almost everything in the house, but our bedroom needs some attention. It's the easiest place for me to forget since I don't spend any time in there unless I'm in bed (I'm usually in one of the kid's rooms or our living/dining room. Brandon unpacked all of his clothes, so hopefully that will motivate me to do the same. 4- Mail out those birth announcements. I can also let everyone know our mailing address. Seriously, this needs to get done. 5- Watch the sun set. The sky out here is HUGE and I often catch glimpses of the brilliantly colored sky as I'm taking my daughter to bed, but I want to go somewhere with an unobstructed view of the sun setting. What a month it's been! We moved across the country, so it's gone by even more quickly than most. 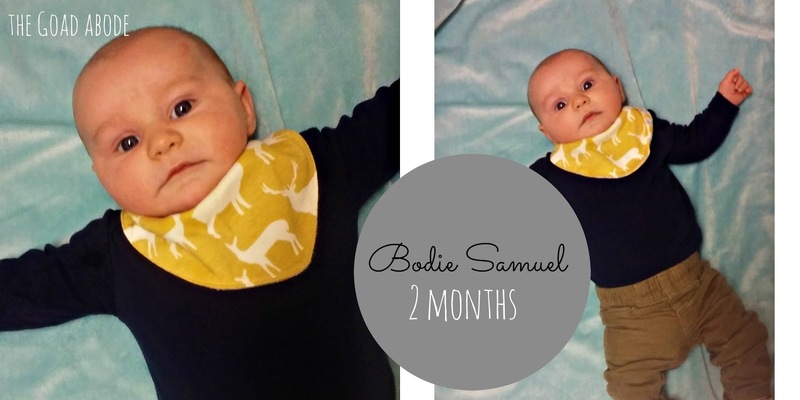 Bodie is growing and changing so quickly. He still has his blue eyes, but has lost some hair. He loves tummy time (the opposite of his sister) and Maggie loves to lay beside him while he's on his mat. She also loves to bring him toys. 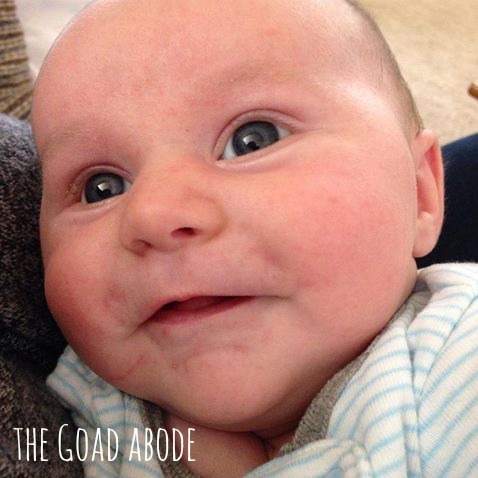 A few things you might be able to tell from the photos: Bodie loves smiling and cooing. In the last week especially, he has really started to smile in response to voices and faces. He's also been babbling a bit too and we love it. Some firsts in the past month included: meeting his maternal Grandpa for the first time, flying on an airplane (from Boston to Denver), going to his first movie (also his sister's first movie in a theater) and finally sleeping in his own crib overnight. One thing I want to remember from the past month was just how adaptable he was. 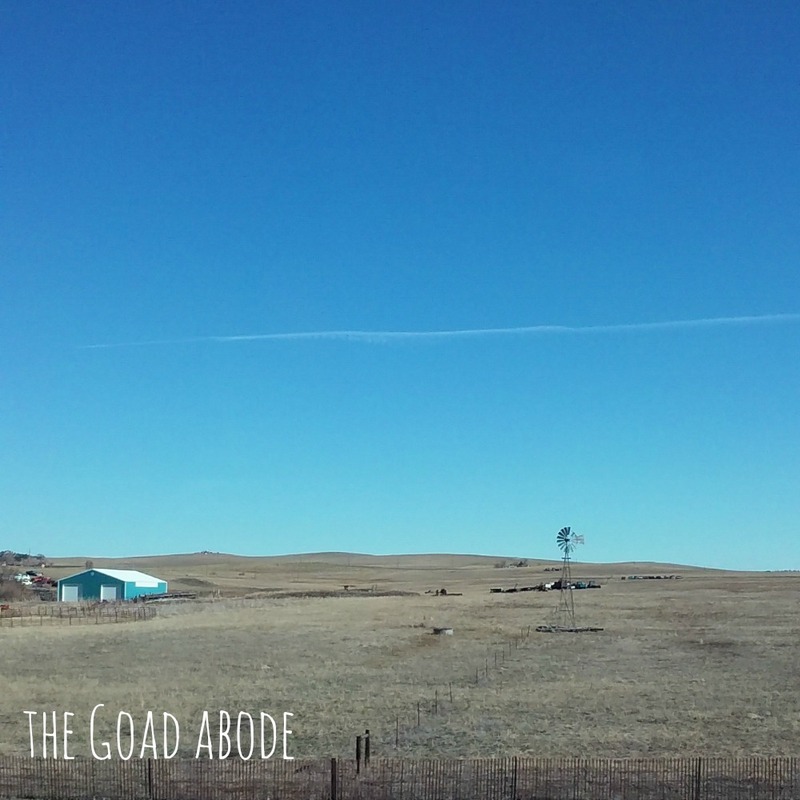 No doubt, I will forget the cross country move with two kids, but Bodie was especially easy-going about changing time zones and great on our 4+ hour flight. I couldn't have asked for a better baby; the kid was a champ. It's been just over a week since we moved into our house in eastern Colorado. We've seen snow, sun and lots of wind. I'd say it's a typical spring in Colorado. And it is good to be back. The fluctuating weather never bothered me and it's not that different from what we left in New England. We finally have wifi at our house. We live about 100 miles from any substantial city. To give you an idea of what we're working with, Amazon Prime shipping doesn't apply in this rural of an area. There it a grocery store, hardware store and a few other shops in town. If you want to go out to eat, there is are two options. It is very different from living in a city of 93,000 people. But I'm quickly learning why small town living has its charm. There is NO traffic. Zero. I only stop at the stop sign because that's how I learned to drive. I can walk almost anywhere in town I'd need to go (i.e. play ground, post office, grocery store). The people are friendly and I can't get used to everyone waving at me. After seven years of living in Massachusetts where you barely acknowledge someone you walk by on the sidewalk, I am not used to everyone being so friendly, but I am starting to like it (or at least not think it's weird). 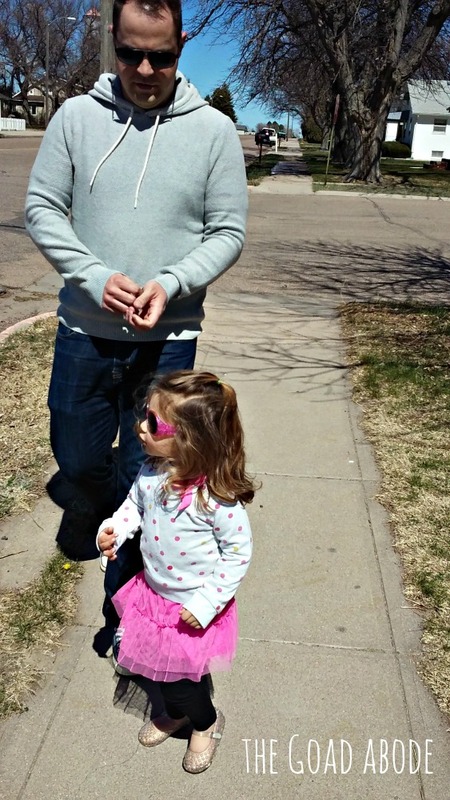 Today, we walked downtown as a family. We stopped in the hardware store for some grass seed, then went to the post office to pick up our mail and then to the grocery store for a gallon of milk. It took us about the same amount of time to do all three errands as it would have to get both kids buckled in the car, drive to our destination, get everyone out and go into one of the stores we needed. Not to mention the weather was perfect. We didn't have to bundle up or wear a rain coat. I'm pretty sure spring is going to be quite lovely. Everyone keeps asking us if we're getting settled. It's a process, but there are fewer and fewer boxes around each day. We are eating at the dining room table, which is something I missed in those last weeks it was packed up before we left MA. We even hung some pictures on the wall, so I think we're on our way to getting settled. Tomorrow morning, Brandon will preach his first sermon as a pastor. There will be a pot luck after the service to say good bye to the interim pastor and welcome us. I still can't believe we're doing this. 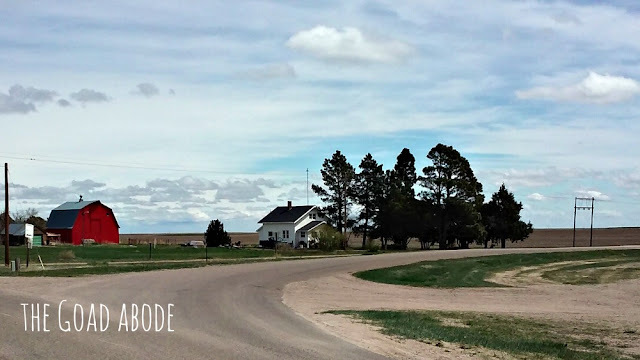 PS I should probably be sharing my April goals, for my first post of the month but I was so excited to finally have the internet, I couldn't help but sharing about our new home.